Warner Bros. announced a live action-packed show starring Gotham's caped crusader will begin touring in summer 2011. 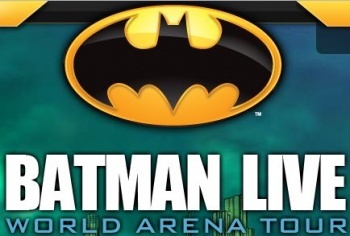 The non-musical live show will incorporate all of the trappings of the Batman universe. Batman and Robin, as well as butler Alfred, will battle many of the iconic villains such as The Joker, The Riddler, Catwoman and The Penguin in a new original storyline created for the show. Set pieces will include Gotham City, Wayne Manor, the Batcave and Arkham Asylum. The show promises to use state-of-the-art lighting, stage-fighting and stunts, pyrotechnics and illusions, and video sequences to bring the story to life. While all of this is really impressive, the important distinction that must be made from the Spiderman: Turn Off the Dark show that is debuting on Broadway soon: Batman Live is not a musical. "When a character has as wide an audience and as rich a history as Batman, it's truly exciting to see him introduced into an all-new storytelling medium," says Jim Lee, a writer from DC and executive creative director on DC Universe Online. "Batman Live will bring a completely new experience to fans of the character - it's great to be able to give them something they haven't seen before." At least it seems like the creative juices behind the show could make it work. All of the theater professionals behind have years of experience putting on a great show. Again, and this cannot be stressed enough, Batman Live is not a musical. The tour is set to begin in Manchester, England in summer 2011, and hit many U.K. cities (Newcastle, Glasgow, Sheffield, Birmingham, London, Liverpool, Nottingham, Dublin and Belfast) before traveling to North America in 2012. Find out more at the official website.